Dragon Ball Super: Episode 16 "Vegeta Becomes a Student?! Win Over Whis" Review – AiPT! In the last episode of Dragon Ball Super … nothing of consequence happened. So we’ll just move right along. Our opening scene is a painful reminder that this show is written by dirty old men, however with a twist this time. While elder Supreme Kai is ogling something on a distant planet, Kibito Kai notices that two planets have disappeared but they aren’t sure as to the reason for the disappearance. This disappearance is not investigated any further in this episode. In an ironic twist, it turned out that the elder Supreme Kai was actually watching two horned beetles battle, not what we all assumed he would be watching, because … yea. We go back to Goku, who is back where he was at the beginning of the series, asleep on the tractor. Apparently Chi-Chi’s strictness in the previous episode is because Goku is going to be a grandfather and he has to show some maturity now. Krillin then shows up and he starts reminiscing about their time training with Master Roshi at the start of the Dragon Ball series. The animation is actually surprisingly well carried over considering how bad the Dragon Ball Z stuff looked when it was carried over. In order for Krillin to understand how far Goku has surpassed him, he asks Goku to punch him. After significant warnings, Goku lets him have it, sending Krillin flying across much of the countryside. Afterwards, Goku delivered Krillin home and resumes his training. While at home, Android 18 patches Krillin up and he admits that he’s glad he gave up martial arts when he did. Meanwhile, we have Vegeta, who apparently is training by standing in one place and yelling for a really long time. Vegeta’s internal monologue continues to go on about him wanting to claim the power of the gods for his own. Continuing to jump around, we then go to Whis and Bulma. Whis has apparently come back to Earth and Bulma is buttering him up with food, trying to get him to guarantee their safety should Beerus return. Vegeta returns home to discover that Whis and Bulma have been spending food time together and Vegeta uses this opportunity to demand that Whis bring him to Beerus. Vegeta wants to show him “the true power and might of a Saiyan”. Whis walks away with Bulma and Vegeta is about to attack Whis but discovers something strange about him. 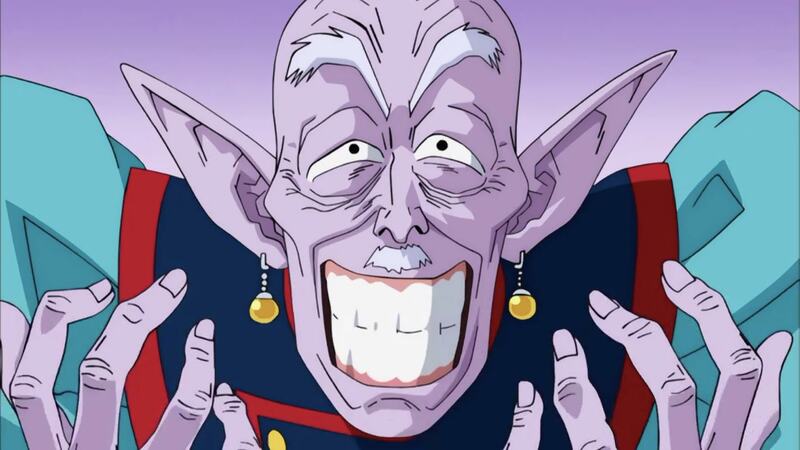 We find out now that Whis is Beerus’ teacher, a tidbit that was mentioned in the Battle of Gods movie. Whis then tells Vegeta that the most important skill he needs is to learn is to control his energy. Vegeta then bows down, requesting Whis to become his teacher. Whis agrees, if Vegeta agrees to become a Destroyer someday. However, Vegeta counters with offering Whis the most delicious meal ever. Vegeta then attempts to find a meal that Bulma and Whis had not been to yet. Vegeta even goes so far as to try and cook up an omelette himself, but he can’t figure out how to crack an egg. With that little pleasure, Vegeta was accepted as Whis’ student. We end the episode as Vegeta arrives at Beerus’ planet complete with a new uniform made by Bulma. Resurrection ‘F’ to Super Time Correlation: Not yet any correlation. Despite not having any correlation with the movie yet, the TV series is currently setting us up for where the characters are found when the movie begins. From the movie we know that Vegeta is training with Whis and here we find out how that happened. As the episodes progress other details of the movie will fall into place. Vegeta becoming a Destroyer God?!?!? I wish they had followed through on that plotline a little more. I hadn’t even remembered that option coming up, but I assume the reason for that was because it was so quickly dropped for the ramen gag. Anyway, I thought this was a rather good episode. Unlike the previous episode which really had no implications beyond the episode itself, here we are starting to put the characters in their places for the beginning of the Resurrection ‘F’ movie plotline to begin (which will be adapted into the series just as Battle of Gods was adapted into essentially the first 14 episodes). Besides just Vegeta, this episode placed many characters into their proper locations. Goku is off doing his thing, Krillin is doing his thing, and everyone is slowly moving towards the confrontation to come. I’m interested to see who gets moved into place next. So, did you like Episode 16 of Dragon Ball Super? Share your thoughts below!